The 150cm Tailors Measure Tape with One Long End is an effective tool for professional and educational seamsters. It has a simple-to-use design, focusing on the universally accepted ruler style, which allows it to be used by individuals of all skill sets. The plain cream and black colour design is highly visible. When paired with a bold black font and line measurement increments, this creates a tool to guarantee you take the perfect record every single time. Manufactured from a flexible fibreglass, it has a strong and durable design. This bends easily around your model or mannequin, allowing you to take accurate body measurements. In turn, when cutting out pattern pieces or creating unique designs, it lays flat on hard surfaces to create straight cut lines. The unique design includes one short metal end and one long. This offers heightened versatility during use. Here at The Ruler Company, we pride ourselves in offering an extensive range of quality designs. From educational environments through to offices and even construction locations, the choices really are endless. 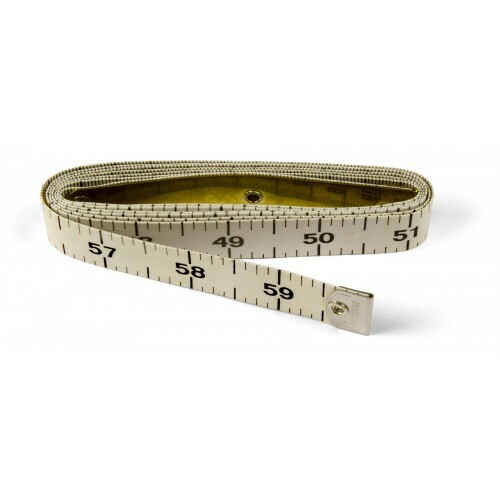 Here, this tailors measure tape provides an easy way to measure up to 150cm in millimetres or up to 60" in 1/8" increments. For bulk orders, we can provide specific discounts depending on quantities. For orders of 10 or more, we drop the individual price to just £0.84. For orders over 100, we drop the individual price to just £0.72. No matter the size of your order, we aim to bring you quality tools at the best prices.